one of my big dreams a Modular Synthesizer in a Modular Sequencer Environment is reality now. A company called Pulsarmodular from Marbella in Spain came up with a AU plugin called the 900 Series Modular Synthesizer. It has a configurable rack with up to four module rows and a large set of installable modules, please see the included list below. It sounds great and is completly to modulate via MIDI CCs from Numerology. You could select the synth modules you need for your classic synth sound. All the Sinus sounds, filter sweeps or the S&H arpeggios from the past are easy to set up. With the envelopes and the VCAs, even the snappy popcorn like sounds are possible, really short and punchy. See the list of modules everything you need is there, LFOs, Noise, Filters, Attenuators but also Analog Delays and a Plate Reverb. And again also here, nearly every paramter is to modulate via MIDI CCs from Numerology. So if you need more than three LFOs or more S&Hs just modulate the desired parammeter. And even the parameters that were not to modulate from with in the P900 like the Resonance of the Filters could been modulated via the MIDI CCs. The only little down side is the preset handling of the P900, but I am saving my own creations just with the complete Numerology Stack and voila it could be loaded in a new N4 project with out any problem. PS 1: The screen shot shows one of my sinus patches which fits in just one module row, but you could expand this up to four module rows if needed. The 900 Series Modular Synthesizer is the result of painstaking analysis and detailed modeling of classic, large format, synthesizer modules. Great care has been taken to make sure that both sound and operation is as close as possible to hardware modules. The hardware accelerated user interface supports arbitrary panning and zooming within the virtual rack, while interacting with controls. It is rendered at a high frame rate to ensure immediate feedback and smooth operation. The P900 supports 4 different voice allocation modes for monophonic and polyphonic patches. a +1 here, Ive been using N4 with P900 for a while now, and its a great combo. the flexibility of N4, and a beautiful sound from P900. btw (might be just a terminology) you don't need to modulate via CC, you can modulate all the params directly from N4. Found no way to use the Numerology parameter modulation with the P900. If I try to use a LFO or a ParamMod there are no usefull parameter destinations shown there. Its only the way LFO to CC Gen to P900 working. So for me its a MIDI CC modulation and yes its a Numerology intern MIDI signal flow. hey thats interesting, Ive just tried again, and your right, now I dont see the full AU parameter list! @jim any thoughts? all parameters are showing in other hosts. unfortunately, I dont have a copy of P900 1.04, but I'll contact Peter from pulsar modular, perhaps I can get an older version, and he might have an idea on whats changed.... its was really cool before! Last edited by TheTechnobear; 06-08-2016 at 06:18 PM. the only version I got working is the 1.07, so I hat no change to see what you describe. now the P900 is at V1.0.10 with new modules and some more modules. now all the parameter modulation works now from Numerology. 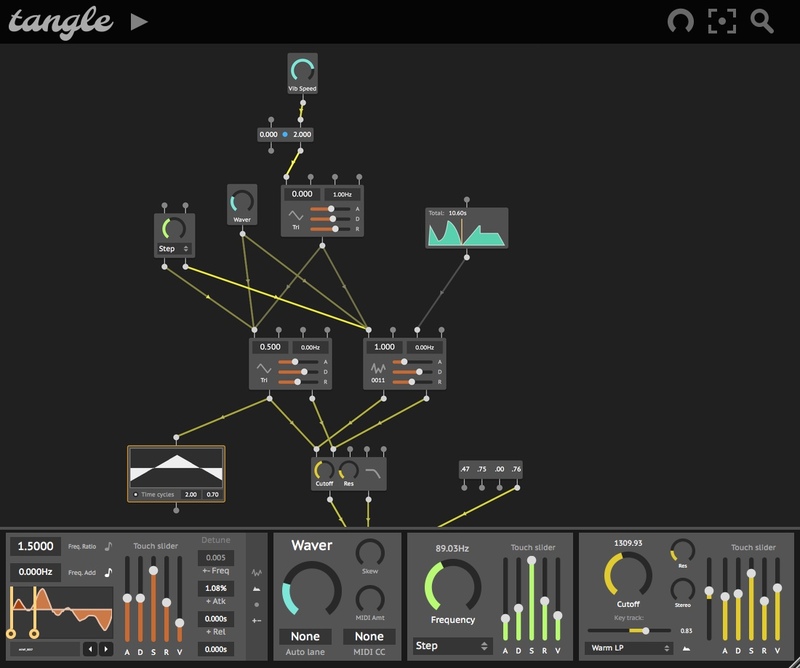 It acts like a real modular including feedback loops, feedback modulation, self modulation and so on. PS: Any one interested in looping N4 envelopes curves for modulations like in a Barton Krell patch? there's also this - basically eurorack looking modular. realistic cables. sounds pretty nice in the demo video and looks pretty straight forward and friendly to use. and this - which i find very interesting and not limited by photorealistic UI. and is only 20 euros it sounds great btw. has a nice tone to it and hifi quality similar to his the Mangle plug in.